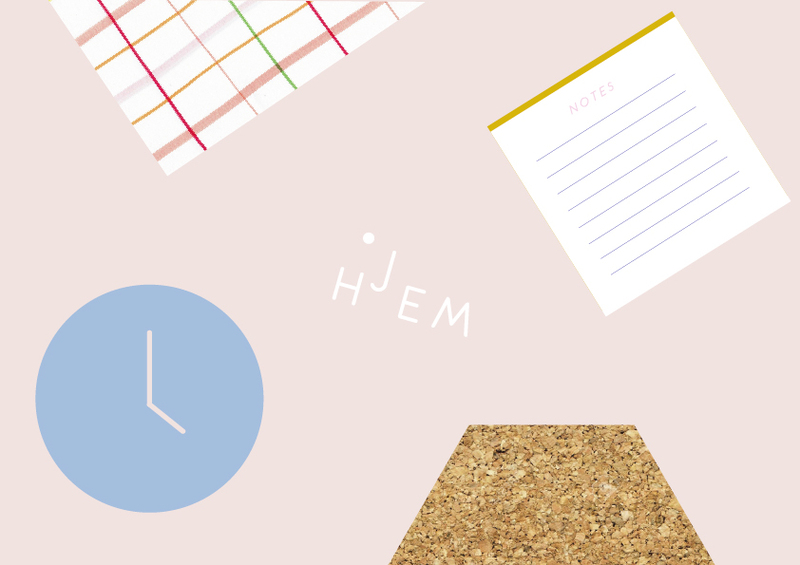 Hjem is a fictional Scandinavian lifestyle store based in Manchester ran by two sisters Emily Baker and myself. We wanted to curate a family business that included all of our interests and bring a bit of culture to an area that hasn't properly been introduced to Scandinavian Design yet. Our main focus for the store is to curate a happy place for people to visit, shop, make and meet up with friends. It will be bright, inviting and will play with all of your senses. Hjem means home in Danish and we'd like to take our customers back to a memory of visiting 'home' and introducing sound, smell, taste and feel to the store experience. Sound: natural sounds of laughter, conversation and happy/feel good music. Smell: fresh baking happening in the in-store cafe and lovely infusers placed around the store. Taste: demonstrated through the freshly prepared food and coffee we sell. Feel: the great quality produce we sell within the store. It is also an events space for us to host creative workshops, talks and events. 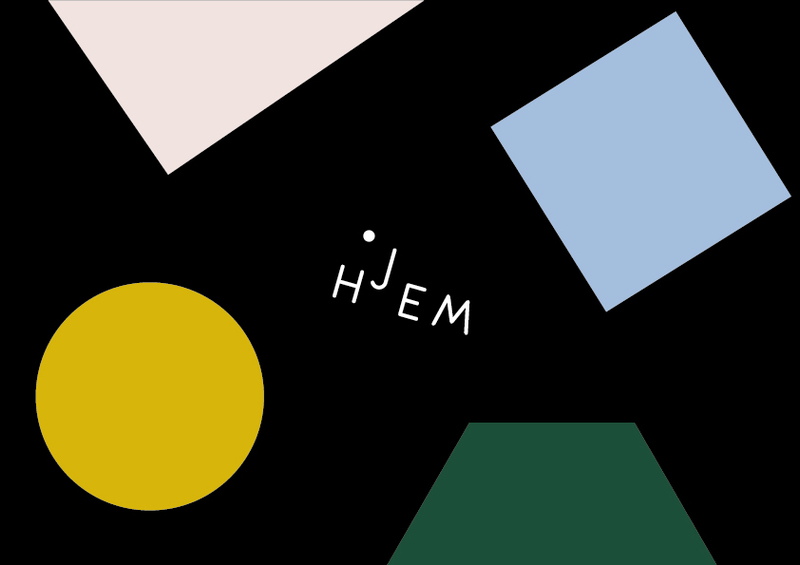 We want to celebrate everything that brings people together at Hjem and I wanted to create an identity that portrayed our whole ethos. 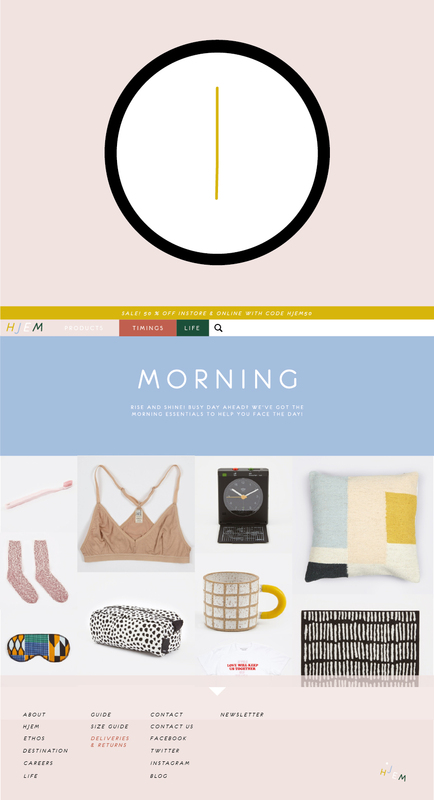 The colours are homely and subtle and the imagery is bright and focuses on the products. The website, identity and packaging were designed by me. It is also my own Photography a part from the product images that are from The Goodhood Store as I felt their products would be of a similar selection. The design for the website is based on being personal, like the in-store experience, I introduced the feature of shaking the mouse which would bright up the holding screen image to demonstrate waking up, you can also hover over the shapes which then would reveal objects. Each object would direct you to the supporting page. For example if you clicked on the clock it would take you to a screen that would show the time of the day on a clock. It would either be Morning, Afternoon or Evening and at each time of day the website would show products that would help you enjoy that time more. Promoting the products and their uses. The rest of the site would be very easy to navigate and be extremely simple as the main focus is the content and products. I introduced a features section too as supporting content for your brand is important and engages your customers. I interview the Blogger, Typographer and Designer Jasmine Dowling and added that to the site and put together a guide on Copenhagen to make the site feel much more than just a catalogue.